This is an authentic DPA5 kit unlike the counterfeit versions currently for sale online. 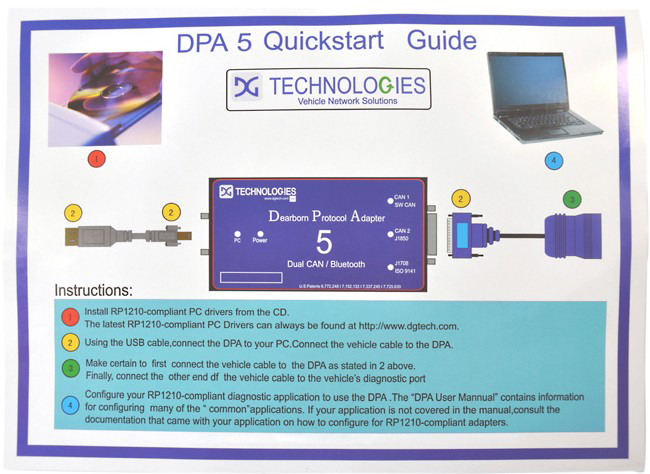 If a DPA 5 kit is listed for sale online with multiple versions of OEM software and multiple cables, odds are it is counterfeit. Contact DG Technologies at cnautotool.com to understand the defects and problems associated with counterfeit DPA 5 kits. DG Technologies does not provide tech support, warranty or repair service for counterfeit DPA 5 units. The RMA number must appear clearly on the outside of the shipping box when being shipped to Dealer. We appreciate your cooperation in our continued effort to provide efficient and timely product service and support Heavy Duty Diagnostic. 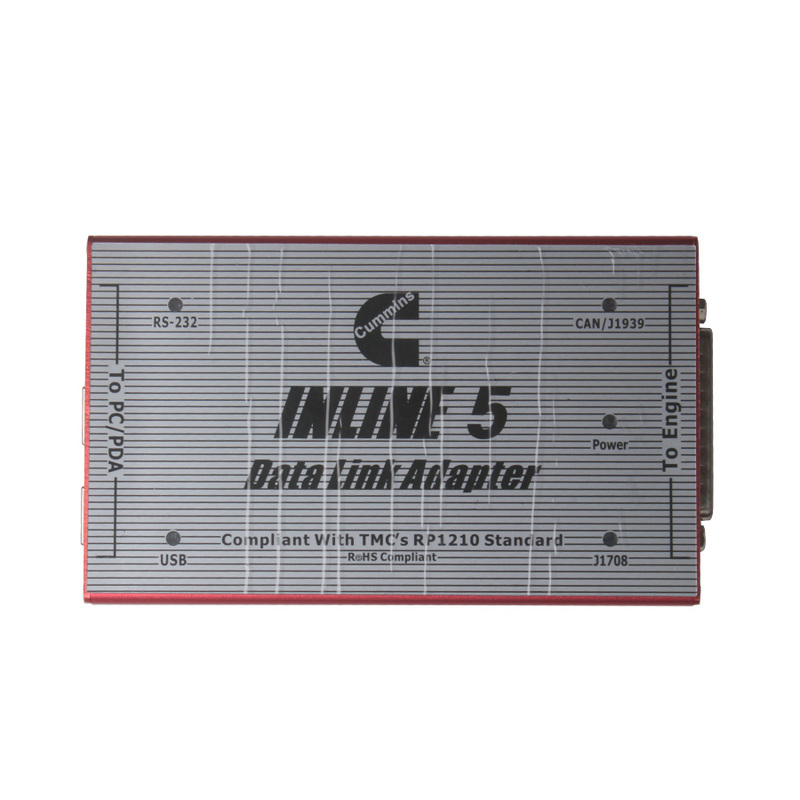 1.The Fastest, Most Rugged, Most Reliable Adapter on the Market for Diagnostic and Reprogramming Activities with both Commercial Vehicle & Automotive Coverage. Manage Service Bay Repairs for Class 1 through Class 8 Vehicles using the software provided. This is an authentic Dearborn Protocol Adapter designed, built and manufactured in the USA. 3.The RP1210 Utilities contain the most up-to-date versions of the utility programs that can be used with your Dearborn DPA5 (and other DPA products). Download the file, extract the contents and run the RP1210Utilities.exe file to begin the install program. Cummins Inline 5 INSITE 7.6.2 license expired error solution can be found in this part. Cummins Inline 5 license expire has two occasions: expired and about to expire. Cummins INLINE 5 software supplies engine information quickly, getting the inside details you need. No matter what kind of equipment you run, Professional Diagnostic Tools INSITE is the one support product to have in your virtual tool box to fit every Cummins electronic engine. After I have it received, actually it works well. However, it gets me in trouble when I received at the beginning. First of all, I have cummins insite software completely installed, and then got to active/register. I was confused with this. And then I got help from my friend Joe. He told me to click Cummins insite software on the desktop and click ok on the registration required window. After input the password, it is ok to click yes. I thought it might be ok finally, while find that I got an error message that INSITE has detected an invalid PC data. Cummins INLINE 5 Diagnostic Tool software supplies engine information quickly, getting the inside details you need. No matter what kind of equipment you run, INSITE is the one support product to have in your virtual tool box to fit every Cummins electronic engine. Cummins INSITE 7.62 is offered in four functional levels: Basic, LITE, RSGR and Pro, ranging from a read only access level to full-function access and capability for the service professional. TOP Authority for FREE.